The Volvo Penta 1 barrel Solex 44 PA1 marine carburetor has the number 61186 in the casting on the top of the carburetor. AQ115, AQ125, AQ131, AQ145, 230A, 230B, 250A, 250B and BB145 are the engine models that this 44 PA1 marine Carburetor is used on. Carburetors 855637, 856046, 856126 and 856123 are the most common Volvo Penta 1 Barrel Solex numbers. To insure the correct carburetor for your marine application please enter all the required information about your carburetor and boat in the text boxes below and then click the Buy Now button to place your order. 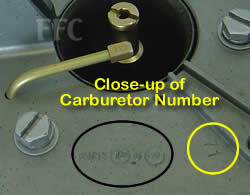 The number stamped on the top of the carburetor in the yellow circle is the carburetor number we need. This stamped number is usually in this spot but can be in a slightly different location on top of the carburetor. Common numbers are: 11, 12, 13, 21, 31A, 45, 62 and 71, but is not limited to these numbers. 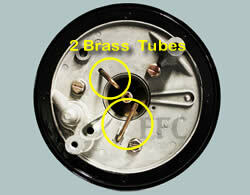 Does your Solex carburetor have 1 brass tube or 2 brass tubes? 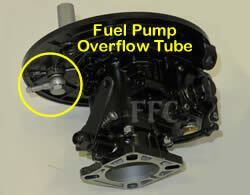 Does your Solex 44 PA1 carburetor have a Fuel Pump Overflow Tube? This line is usually a clear yellowish vacuum type line that goes to the fuel pump from the carburetor. 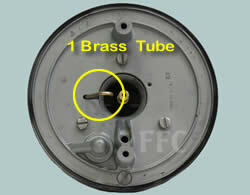 If your carburetor has one and it is not being used select "Not Being Used". If your carburetor has a stripped gas inlet or the top of the Solex carburetor is warped or cracked, please list in the Additional Comments box above. Serving our valued customers for over 35 years. We use only new parts and the carburetor is coated with a long lasting Aluminum Oxide finish and then coated with black lacquer paint for extra protection. Delivering you a completely tested, calibrated, and idle adjusted carburetor. Our marine carburetors are ready for easy installation and come with a complete one year warranty. We pay for you to return the old core from anywhere in the continental United States. 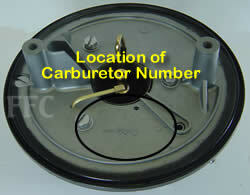 The carburetor includes a UPS return shipping label. Repack your core in the box that your carburetor came in, adhere the UPS label, and give to any UPS driver or bring it to any UPS drop box. Please allow a few days for us to check-in your old carburetor core. We will then issue a prompt core refund.